Over the course of an academic year, Byrd and fellow students Zane Duke, Amber Graviet, and Qassem Naim developed a device and process that would make non-invasive, cost-effective glucose readings possible for diabetes patients. 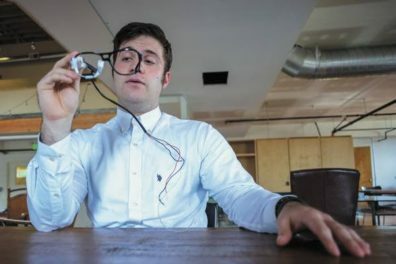 Through a combined entrepreneurship and engineering class and business plan competitions, the team gained the initial knowledge and support they needed to launch their startup Co-Optical. With that momentum and the potential of the technology, each member of the team was willing to take jobs upon graduation while also committing to be full-time entrepreneurs. Even with that enthusiasm and drive, entering the notoriously challenging biotech landscape is a whole new ball game. Thanks to growing resources in the Palouse and cross-state collaboration, however, this budding biotech company can continue growing in Washington. Upon graduation, the team wanted to continue developing Co-Optical in Pullman. It was a lower-cost option and gave them access to the professors who provided both scientific and entrepreneurial guidance. He and his wife Judy decided to play a role in providing those resources, and collaborated with other local economic development groups to start the Crimson Commerce Club, an incubator space and business resource. Co-Optical became the first startup in that space – Byrd and Duke setting up shop there to continue technical development, while the other half of the team moved to Seattle to focus on business development. In addition to the incubator space, the Kolde’s are collaborating with the Washington State Department of Commerce and the Southeast Washington Economic Development Association (SWEDA) on Startup 365 – a pilot program focused on connecting rural communities to urban entrepreneurship ecosystems. Over the course of two years the organizations are developing best practices for effective collaboration to demonstrate a sustainable model that could be replicated throughout Washington. Co-Optical is benefitting from some of that rural-urban connection through networking opportunities with SWEDA, and increased access to certain grants. Another collaboration led by the Port of Whitman to establish wet lab space in the Palouse, making it possible for biotech and other companies that require lab research to stay in the area. All of these new collaborations bolster existing efforts – including the “Be the Entrepreneur” Bootcamp hosted by the Palouse Knowledge Corridor, which Co-Optical participated in last year, and Judy participated in this year. With a strong and cos-effective foundation in Pullman, the Co-Optical team can also take advantage of statewide resources. One of the most significant relationships was initiated by the NIH SBIR Conference held in Washington for the first time last November. In addition to learning about the SBIR grant process, the team met commercialization experts from Life Science Washington and became the youngest group selected for the WIN Mentoring program. “Co-Optical, although early in their commercialization journey, impressed the WIN screening committee with their unique solution to an important market problem,” said Linette Demers, vice president of commercialization for Life Science Washington. WIN is a team-based mentoring program that assists young life science startups by providing them with highly experienced mentors. Entrepreneurs benefit from the vast experience and different perspectives of their team, and also the expansive networks that each mentor brings to the program. Co-Optical is benefiting from the insight of veteran medical device entrepreneurs, who are helping them navigate product development and prepare for the first round of fundraising. The team is conducting the research required to refine the device, gain FDA approvals, and start production. On their current trajectory, they plan to start raising their first round of funding by next year. Co-Optical is driven by the passion of the team to ease healthcare for millions worldwide, and the collaborative network of Washington resources can help nurture that passion into reality.